While studying this Carcassi étude — and analyzing as many version as possible in aid of that — I realized that classical music is like wine. They’re both based on a central theme or taste, and it’s the subtle differences between the interpretation of each performer or wine maker that make them unique and interesting. That’s why you need to listen to a lot classical music (or drink a lot of wine) to develop a palate. I bet two different musicians (or even the same musician at two different points in their career) playing the same piece would sound the same to some people for the same reason that two different merlots would taste the same to others. This is supposed to be played allegro, but I’ve yet to hear a version above 105 bpm that didn’t feel rushed to me, so I prefer to play it andante1. Luckily, I enjoy classical music, and I can tell the time I’ve invested in developing that foundation translates over to non-classical songs, not only in the extra finger precision but in practicing techniques too. I’m still using electric strings2, which I’ve had on longer than any other set, cause I love how crisp and brassy the tone is throughout the range. For a piece like this where the melody switches between bass and treble, that becomes really important. Singhouse Studios is a voice and performance school for people of all ages, and one night every year the students perform in a big show. This year, the show — titled Sparkle — was celebrity-themed, complete with a melange of hits from the last five decades, a red carpet runway for all the stars, and even Ottawa’s local pop heartthrob, Alex Lacasse1. Music by Five Stripe Studios. Adrian and I worked closely to make sure the music had the right kind of playful energy to focus on the school’s main demographic. I was asked to create a promotional video for the studio, so I followed the performers to tell the story of their day, from the backstage to the main stage. I felt it was as important to see all the preparation as much as the performances themselves, which is why I included footage of warm-up routines, practice rituals, and dress rehearsals. I love to see the focus so many of the young performers have, and much of that comes out before they even step into the spotlight. I’m very pleased to say that I’m now working with Five Stripe Studios, a talented boutique music composition studio, to score my films. Music is one of the most important parts of any film, and the right music can make great footage look even better. Choosing the right music also happens to be one of the most difficult parts of the storytelling process. For one wedding, I spent a week looking for the perfect song. When I discovered it had an inappropriate line (nothing vulgar, just very unfitting for a wedding), I spent another week trying to find a replacement, but eventually went with my original choice, using audio software to take the line out. Kyden’s First was a small project we worked on to make sure we were able to communicate effectively at different stages of the scoring process. It made sense to find a more capable person to handle this responsibility, and I just happened to come in contact with the right person at the right time. Adrian is the creative director of Five Stripe Studios, and not only does he write the music, he sings, plays, and records it as well. I met him in Australia when we were much younger1, and he contacted me after coming across my work many years later. This not only gives me total control over the music, allowing me to choose the right instruments, tone, pace, and mood, but I have more options with the footage as well, as I sometimes found myself leaving out a great scene out to match another scene with a certain part of a song. Adrian is also a very dynamic composer, and can give me widely varying styles and genres; exactly what I need when working with all the different things I film. 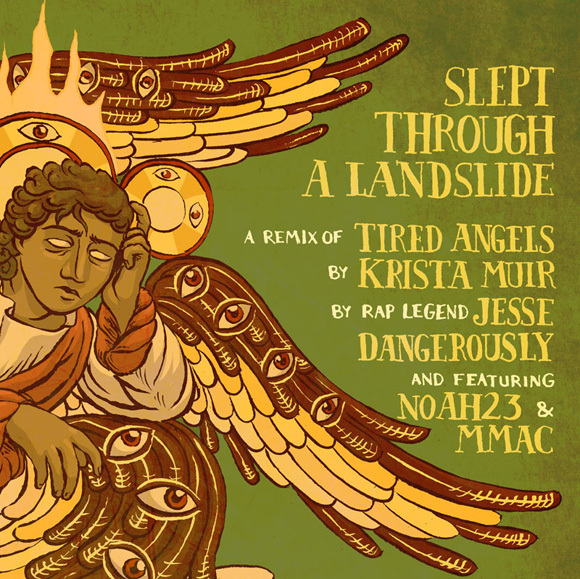 Rap Legend Jesse Dangerously just released his latest single1, a remix of Tired Angels from Krista Muir’s most recent album. He wanted a bit of breathing room between verses and asked me to write a ukulele solo, so we hit the studio a couple months ago. I was lucky enough to learn a lot about the recording process that had largely remained a mystery to me. This was my first time trying to write music that wasn’t a cover. It was unique challenge, cause it’s hard for me to tell what sounds good vs. what sounds good only to me. I also have a habit of trying to fill my arrangements with too many ideas instead of following a theme, so this time I tried to build on the hook that Krista sings. Then I added as much vibrato as I could on my soft cedar-topped nylon-stringed uke to fill out the sound. I also provided some backup harmonies at the start of Noah23’s verse, and it’s weird to hear my singing with some real production. I don’t think I’d recognize my own voice if someone didn’t tell me it was me. Jesse has the ability to piece together a bunch of motley musical ideas from various genres, and it’s awesome to hear something that started out as a simple rap song become more than the sum of it’s parts. I was very excited to be working with Liz again when approached me to shoot a promo video for her photography business. Since she does engagements, weddings, and pet portraits, we decided to film all three types of sessions. Liz lists some of her favourite things as her hubby, her pups1, her shoes, and her Apple products, so I included little bits of each to give it a personal touch. I also kept the grading crisp and clean with colours that pop out of the screen to match Liz’s style of vibrant photography, of which I’m a huge fan. My main goal, however, was show how fun it is to be one of her subjects because she has a perpetual smile and bubbly personality that puts anyone at ease.